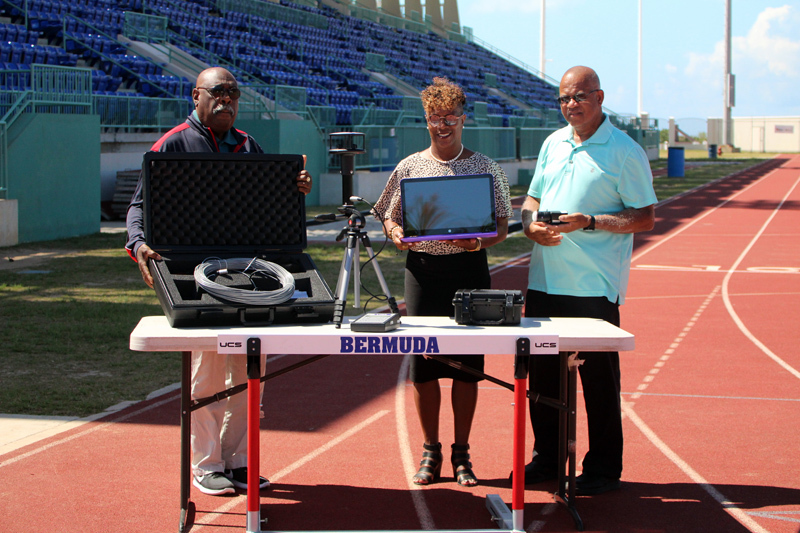 The Bermuda Olympic Association [BOA] has announced that the Bermuda National Athletics Association [BNAA] has received new equipment for its athletes. A spokesperson said, “Attributed to the partnership between the BOA and the Pan American Sports Organization [PASO], new athletic equipment was purchased to help the BNNA in support the development of Athletics in Bermuda. “Two Lynx wind gauges. Lynx wind gauges can be line or battery power to replace the older GILL model units which were just battery power. This improves their reliability. The new wind gauges can function, as standalone units for events, such as Long Jump and Triple Jump. “It will also allow for automatic, electronic integration into the FAT system to provide the wind readings. The wind gauge is used to measure the wind force at the time of an event to ensure any record breaking attempt conforms or is within the required wind requirements. “Fifty hurdles and eight starting blocks to replace the aging sets that are currently being used. “One IdentiLynx camera. The IdentiLynx digital video is fully integrated with FinishLynx photo-finish results. This means that users can simply click anywhere in the FinishLynx image capture and watch a full color IdentilLynx video jump to precisely the same moment in time but showing a head-on view of the finish line.